Joe Marcus (@joeasaprap) posted this photo of the damaged engine on Southwest Airlines Flight 1380 after an emergency landing at Philadelphia International Airport on Tuesday, April 17, 2018. A bank vice president from New Mexico died Tuesday when a Southwest Airlines flight experienced engine problems at altitude, forcing an emergency landing in Philadelphia. Jennifer Riordan of Albuquerque, a mother of two children, was identified by officials late Tuesday as the passenger who died. She was a vice president of community relations for Wells Fargo. Riordan suffered fatal injuries when a piece of the engine, perhaps a fan blade, struck the aircraft and broke a window, causing her to be nearly sucked out of the aircraft before she was pulled back in by fellow passengers. Riordan was the first passenger to die on a U.S. airline in nearly a decade and the first in the history of Southwest Airlines. 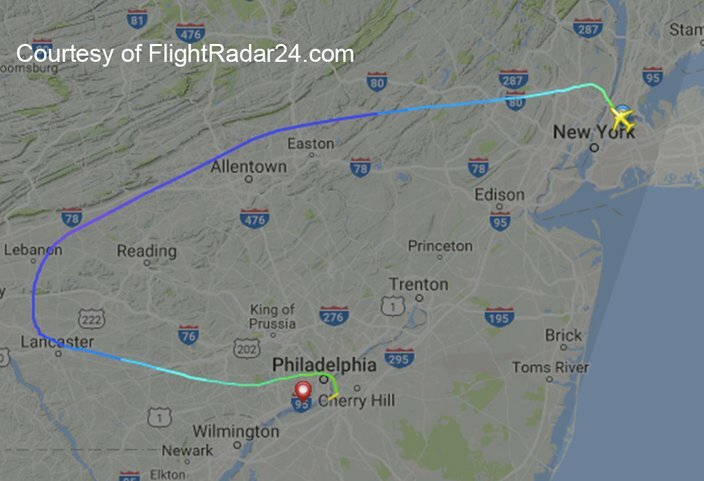 Flight 1380 was diverted to Philadelphia after the engine apparently failed soon after its 10:30 a.m. takeoff from LaGuardia Airport in New York City at 10:30 a.m. En route to Love Field in Dallas, the plane headed toward Philly for an emergency landing as it flew over Lebanon County, Pa., according to FlightRadar24.com. "We do know that there have been injuries," NTSB Chairman Robert Sumwalt said. "We would like to offer our condolences to all of those that have been affected by this event." Riordan was rushed to a Philadelphia hospital when the plane landed, according to multiple media reports. 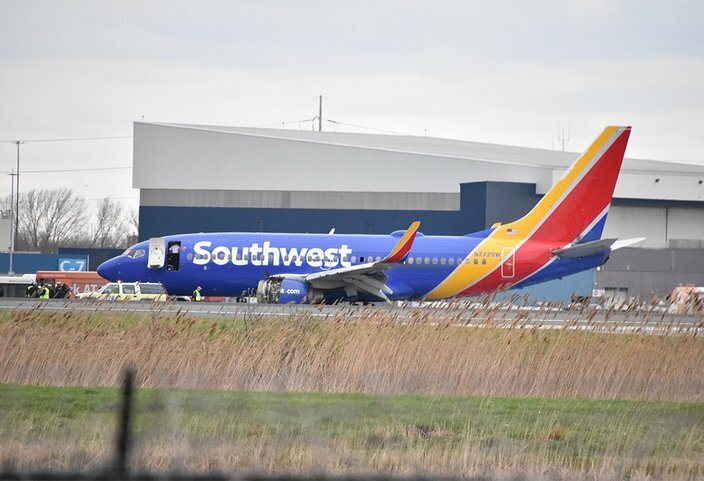 Southwest Airlines issued a statement Tuesday afternoon stating its "hearts are with those affected" by the harrowing accident and emergency landing. Southwest Airlines Flight 1380 – from New York City to Dallas – headed for an emergency landing in Philadelphia while flying over Lancaster County. Sumwalt addressed the media before an NTSB investigative go-team left Washington for Philadelphia around 3:30 p.m. Agency staffers arrived here shortly after 5 p.m. to begin their investigation into the cause of the incident and examined the engine before dark. 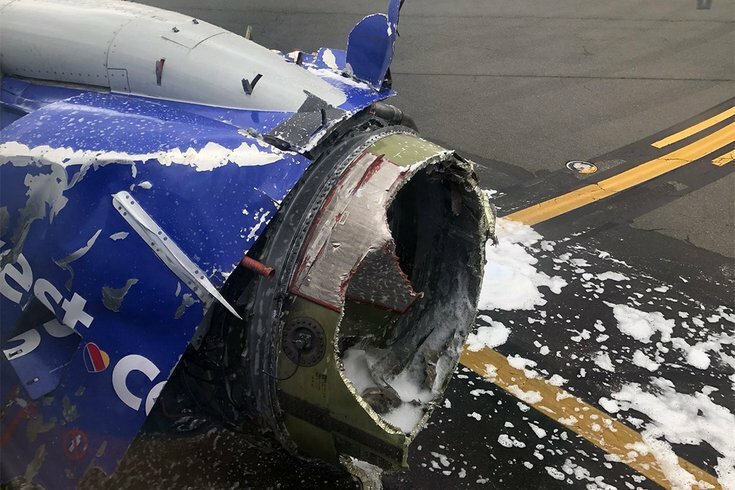 Sumwalt earlier dismissed reports that the engine had caught fire and cautioned against deeming it an "uncontained engine failure" until investigators could examine the damage done to the engine and fuselage. "At this point, we are saying this is an engine failure," Sumwalt said. "Once we get there and look at it, we may say, 'Well, in fact this is an uncontained engine failure.'" The aircraft, a Boeing 737-700, had 144 passengers and five crew members on board, according to Sumwalt. Seven passengers were injured, according to Fire Commissioner Adam Thiel. The NTSB expected to have a readout from the plane's recorders sometime Tuesday night, Sumwalt said. The engine eventually will be shipped off-site so investigators can conduct a detailed examination. "This will be an extensive investigation," Sumwalt said. "We do expect to release further information once we're in Philadelphia. We don't have a lot of factual information to report at this time." After the emergency landing, the Federal Aviation Administration issued a ground stop for planes at other airports waiting to depart to Philadelphia. That was lifted at 1:45 p.m.
Flights were delayed at the airport throughout the afternoon. Several passengers posted pictures of the damaged engine on social media once the plane landed in Philly. Meanwhile, firefighters could be seen spraying the plane's engine and passengers were being bused to the terminal. Passengers on board the aircraft posted a flurry of messages and images to social media. Some feared for their lives. Marty Martinez, of Dallas, posted a Facebook Live video that showed him wearing an oxygen mask as the plane made its emergency landing, writing "Something is wrong with our plane! It appears we are going down! Emergency landing! Southwest flight from NYC to Dallas!!" Martinez later posted several pictures of the plane, including the damaged engine and broken window, which was three seats away from him. He wrote that the "engine exploded in the air" and that oxygen masks deployed. "I literally bought WiFi as the plane was going down because I wanted to be able to reach the people I loved...thinking these were my final moments on earth," he posted. Other passengers also posted to social media. Kristopher Johnson, a passenger on the flight, posted a couple of tweets, including a photo of the engine. He also noted that a passenger suffered a "serious injury" but that "luckily" there were several medical professionals on board the plane to assist. Shortly after the emergency landing, Southwest Airlines pinned a tweet to the top of its Twitter page, providing initial details. "We are in the process of gathering more information," Southwest Airlines wrote in a tweet. "Safety is always our top priority at Southwest Airlines, and we are working diligently to support our Customers and Crew at this time."